Picard attempts to reunite a group of pirates with their peaceful homeworld, but ancient grudges threaten to destabilize the negotiations. The Gatherers = space pirates = awesome. Picard makes the decision to reunite the Acamarian people without any hesitation or consultation with Starfleet that we know of. His mission is a noble one, but it seems odd that he comes to it unilaterally and so quickly, before even the victims of the Gatherers have come around. 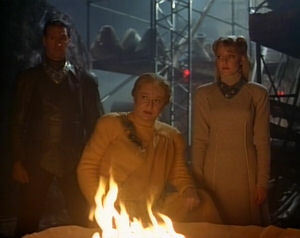 At the beginning of the episode, it is indicated that the victims sustained multiple phaser hits and survived. Later, we learn that the Gatherers use "Regalian phaser rifles," which Data explains aren't very powerful. Good continuity. I don't understand why or how Yuta is so young, both from the context of the episode and from the context of the narrative. There just doesn't seem to be any purpose to it, because you could easily have her be the last of her clan without having her be virtually immortal. It's just unnecessary and illogical. There are things I like about this episode, especially that the unassuming servant girl is a hidden assassin seeking revenge for her clan, but on the whole, I think this is the weakest episode of the season so far. Brull reminds me a little of Nero in 2009's Star Trek.